Quite a bit of discussion took place over the past week in the wake of a January 7, 2016 article in the National Catholic Register written by Msgr. Charles Pope. Msgr. Pope is one of the principal celebrants of the Extraordinary Form in the Archdiocese of Washington, DC, previously assigned to the principal site for the Tridentine Mass there, St. Mary Mother of God in the Chinatown district. 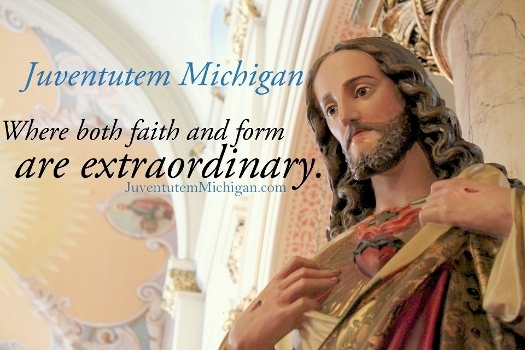 To this day he remains a sought-after celebrant and is one of few voices for tradition in that archdiocese. Msgr. Pope posited that growth in Tridentine Mass attendance has topped off. Citing what he admits is only “anecdotal evidence”, he points out that attendance at a monthly Solemn High Mass, presumably at St. Mary’s, has dropped to one-third of what it used to be circa 1990. He suggests that Catholics are not doing an effective job of evangelizing the Traditional Mass, and that its future is in question unless attendance grows. Some of his points have merit: It can grow wearisome, for example, to read comments on blogs in which posters contend that not enough is offered by their local Mass sites, e.g. : “We need catechetical programs, support groups for homeschooling parents, and more parish activities.” Just who do these posters think make such things happen? It’s not some amorphous “they” out there; it’s parishioners like you and me. The Tridentine Mass scene in our era is largely a lay-led movement. If one wants more activities offered at a Latin Mass site, one should be prepared to pitch in and organize them before complaining that they don’t exist. On the other hand, the situation in and around Washington, DC is sufficiently complex to warrant a more thorough analysis of Msgr. Pope’s observations. The Beltway region consists of three dioceses: Washington, Baltimore, and Arlington, Virginia. The Arlington diocese happens to be one of North America’s overachievers: it has the highest percentage of parishes offering the Extraordinary Form of any diocese in our continent. Most of those began post-Summórum Pontíficum. When more sites debut, they don’t solely attract newcomers to the Traditional Mass; some of those who formerly traveled longer distances may prefer to commute to a closer Mass. It is undeniable that the proliferation of Masses in the DC region has – understandably – caused attendance at some of the older sites to decline. Msgr. Pope proceeds to cite the “low” attendance of 200 families at the now-condemned Shrine of Christ the King in Chicago as further proof that attendance has peaked, failing to note that the Chicago Archdiocese trails only the Diocese of Arlington in number of TLM sites among North American dioceses, with some in beautiful historic churches in more central locations. Sacred music expert Jeff Ostrowski published a rebuttal to Msgr. 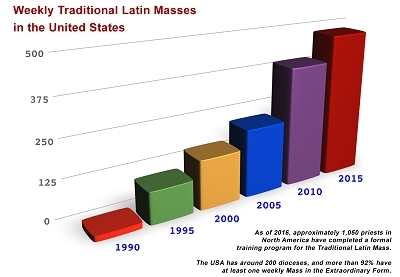 Pope’s piece on the Corpus Christi Watershed web site, including the above graph depicting growth in weekly Tridentine Mass sites. For proof of growing clerical support for the TLM, the Fraternity of St. Peter published a graph of its membership numbers. In summary, while Msgr. Pope’s warnings against passivity and complacency are indeed valid, his anecdotal experience does not match the evidence that growth continues to occur. By way of analogy, we are at a stage of growth comparable to when suburban shopping malls began to proliferate. Yes, they stole business from large downtown department stores, and yes, the new stores may be smaller than the old ones, but the amount of retail commerce overall has grown as shopping has become more convenient and closer to people’s homes. Once the only way to go a TLM was to go to St. Mary's. I met people who had driven over an hour to get there. Now, you can go Mass in Arlington which is closer to home. The people who used to come from West Virginia and Pennsylvania now have options in their own states, thank God. As for activities, that is not why I go to Mass. The woman who has packed her 9 children into the van and driven 2 hours to get to Mass is tired. Asking her to do this multiple times a week is nuts. "It is undeniable that the proliferation of Masses in the DC region has – understandably – caused attendance at some of the older sites to decline." Speaking as someone who has been attending TLM's in DC for the last eight years: It is indeed undeniable. We lost a fair number of Virginians when the TLM's began proliferating across the river. It's also true that there are a remarkable number of Solemn High Masses in the area on a regular basis. Time was when the St. Mary's monthly SHM was something truly rare. But now it's one among many SHM's. And that seems to be one reason why fewer traditional Catholics feel compelled to make the trip down to Chinatown on that one Sunday night per month - especially since odds are they've already fulfilled their Mass obligation that day. Juventutem DC dug into the local situation a little more in their piece at OnePeterFive a few days ago (I'd drop the link but I'm not sure that's allowed here).